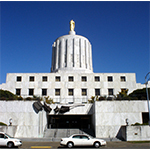 SALEM, Oregon — The Oregon legislature could reinstate the environmental regulations that President Trump has rolled back to help businesses. The Oregon Environmental Protection Act would renew and implement rules for the Clean Water Act, Clear Air Act and Safe Drinking Water Act that were scaled back by the federal government. Shawn Jillons, the executive director of Oregon Manufacturers and Commerce says Oregon agencies cannot afford the added workforce that would be needed to enforce the rules. “Every single proposed rollback or perceived rollback is taking up agency time and law actually never goes into effect,” Jillons explained. Some lawmakers expressed similar concerns. Governor Brown said Oregon has been a leader in environmental regulation and this bill would help maintain that protection.